Home » Why Use A CRS When Buying Or Selling Your Home? Why Use A CRS When Buying Or Selling Your Home? 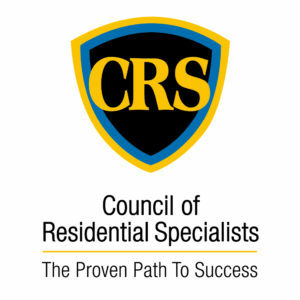 Since 1977 the Council of Residential Specialists has been conferring the CRS Designation on agents who meet its stringent requirements. Currently, there are more than 34,000 active CRS Designees. Today, home buying and selling is faster, more complex, and more competitive in every way. Our goal is to make the process a little easier for you. The first step is choosing the right REALTOR®. Experience — To earn the Certified Residential Specialist (CRS) Designation, every REALTOR® must have significant experience and volume of real estate transactions. Ethics — Every CRS Designee is required to maintain membership in the NATIONAL ASSOCIATION OF REALTORS® and to abide by its strict Code of Ethics. A Focus on Home Buying and Selling — To help make the home buying and selling process more rewarding, every CRS Designee must have a proven track record in the business, as well as advanced education in related areas like finance, technology and marketing. Work with the top 4 percent. Technology Expertise — The training available to CRS Designees includes a strong focus on technology and its applications in the real estate business.